Comfortable excellent rooms, very good location, fabulous pure vegetarian restaurant, very nice obliging and helpful staff right from front office manager to bellboys. Everything was very good... Including the staff courtesy, cleanliness, food. All that was said was offered execpt the room was Small (Which i was given if compared to other standard rooms).Other than that all was good.Staff Behaviour is Praiseworthy. The only thing missing was a king size bed, as we were travelling with Family and two single beds did not make sense, apart this one thing I was extremely happy with my stay. Clean and tidy, excellent service, staffs very helpful and cooperative, great place for every one. The hotel presmises was neat and clean. Wifi facility was not available throughout the stay and the same was available only in the reception area but not in the room on 2nd floor level. House Keeping staff did not replace the required room/bathroom utilities on time, which should be their responsibility. Very neat. Room service was good. Value for money. The bathroom doors were very dirty. No basic toiletries. The room service menu was bad and limited. They never provided the wifi although it was part of the package. The breakfast was fine but limited spread. Sanman Gardenia By BigTree Hotels This rating is a reflection of how the property compares to the industry standard when it comes to price, facilities and services available. It's based on a self-evaluation by the property. Use this rating to help choose your stay! Offering a restaurant, Sanman Gardenia is located in Bangalore City. Free Wi-Fi access and a 24-hour front desk. The property is located just 1,500 feet from the local bus stand. Bangalor Central Mall is 2.5 mi away. Bangalore City Railway Station is 3.1 mi away. Bengaluru International Airport is 24 mi away. Rooms here will provide you with a flat-screen TV, air conditioning and a mini-bar. There is also an electric kettle. Featuring a shower, private bathrooms also come with free toiletries. Extras include a seating area and cable channels. At Sanman Gardenia you will find currency exchange facilities and a business center. Other facilities offered include meeting facilities, a tour desk and luggage storage. Ruchi restaurant serves pan-Indian and International fare. Room service options are also available. Jayanagar is a great choice for travelers interested in luxury brand shopping, botanical gardens and cold weather. 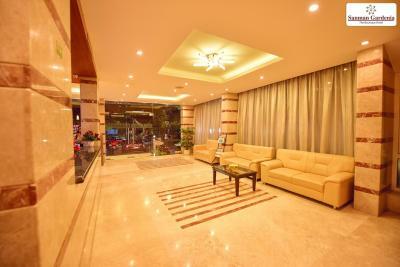 When would you like to stay at Sanman Gardenia By BigTree Hotels? Spacious rooms here will provide you with a flat-screen TV, air conditioning and a mini-bar. There is also an electric kettle. Featuring a shower, private bathrooms also come with free toiletries. Extras include a seating area with a sofa and cable channels. House Rules Sanman Gardenia By BigTree Hotels takes special requests – add in the next step! One additional older child or adult is charged INR 600 per person per night when using existing beds. Sanman Gardenia By BigTree Hotels accepts these cards and reserves the right to temporarily hold an amount prior to arrival. Please inform Sanman Gardenia By BigTree Hotels of your expected arrival time in advance. You can use the Special Requests box when booking, or contact the property directly using the contact details in your confirmation. Lot of noise and we got disturbed till midnight..could not sleep properly .. Overcharged , we were told snacks are complementary and while check out charged us amount. Housekeeping in the room needs substantial improvement. Dinner buffet was mostly cold. Staff was cordial. Buffet breakfast was great.